4. At the death of a Christian, whose life of faith was begun in the waters of baptism and strengthened at the eucharistic table, the Church intercedes on behalf of the deceased because of its confident belief that death is not the end nor does it break the bonds forged in life. 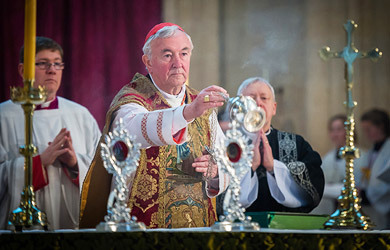 The Church also ministers to the sorrowing and consoles them in the funeral rites with the comforting word of God and the sacrament of the eucharist. 5. Christians celebrate the funeral rites to offer worship, praise, and thanksgiving to God for the gift of a life which has now been returned to God, the author of life and the hope of the just. 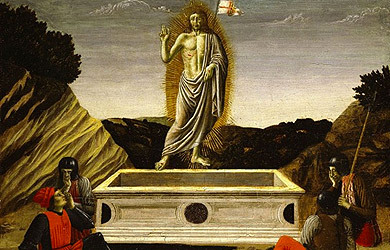 The Mass, the memorial of Christ’s death and resurrection, is the principal celebration of the Christian funeral. 6. The Church through its funeral rites commends the dead to God’s merciful love and pleads for the forgiveness of their sins. At the funeral rites, especially at the celebration of the eucharistic sacrifice, the Christian community affirms and expresses the union of the Church on earth with the Church in heaven in the one great communion of saints. 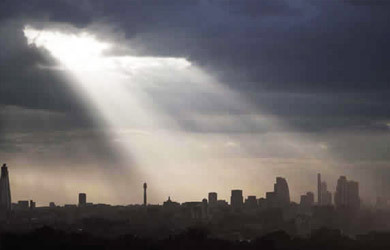 Though separated from the living, the dead are still at one with the community of believers on earth and benefit from their prayers and intercession. At the rite of final commendation and farewell, the community acknowledges the reality of separation and commends the deceased to God. In this way it recognizes the spiritual bond that still exists between the living and the dead and proclaims its belief that all the faithful will be raised up and reunited in the new heavens and a new earth, where death will be no more. 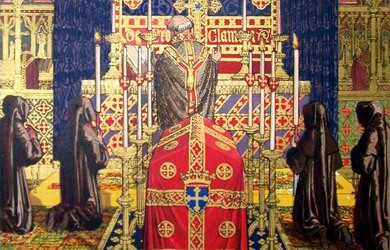 “In the prudent judgement of the local ordinary, ecclesiastical funerals can be granted to baptized persons who are enrolled in a non-Catholic Church or ecclesial community unless their intention is evidently to the contrary and provided that their own minister is not available” (canon 1183.3). “The Church earnestly recommends that the pious custom of burying the bodies of the deceased be observed; nevertheless, the Church does not prohibit cremation unless it was chosen for reasons contrary to Christian doctrine” (canon 1176.3). While the Church continues to hold a preference for corporeal burial, cremation has become part of Catholic practice in many parts of the world. The Church’s reverence and care for the body grows out of a reverence and concern for the person whom the Church now commends to the care of God. This is the body once washed in baptism, anointed with the oil of salvation, and fed with the bread of life. This is the body whose hands clothed the poor and embraced the sorrowing. The human body is so inextricably associated with the human person that it is hard to think of a human person apart from his or her body. The Holy See has granted permission to allow the diocesan bishop to permit the presence of the cremated remains of a body at a Funeral Mass. However, the Order of Christian Funerals‘ Appendix on Cremation states: “Although cremation is now permitted by the Church, it does not enjoy the same value as burial of the body.The Church clearly prefers and urges that the body of the deceased be present for the funeral rites, since the presence of the human body better expresses the values which the Church affirms in those rites” (no. 413). The growing interest in and desire for cremation continues to remain a question in the minds of many Catholics. Resources on this website are available to help better explain and deepen the Catholic understanding of cremation as an option for the final disposition of the body.